Say hello to spring with this calligraphic embroidery pattern surrounded by tiny blooming flowers! It's a great pattern for beginners to learn a few new stitches, and for anyone who wants to celebrate the season. This pattern is part of a free seasonal embroidery pattern series, so you can stitch one of these designs for each of the four seasons! The autumn pattern is surrounded by tiny leaves and the winter design has miniature snowflakes. These designs are great for framing as hoop art. You could even place the hooped embroidery on a grapevine wreath to welcome spring on your front door! The size of the spring pattern is perfect for stitching on a tea towel. What a great way to bring a bit of the new season into your kitchen! 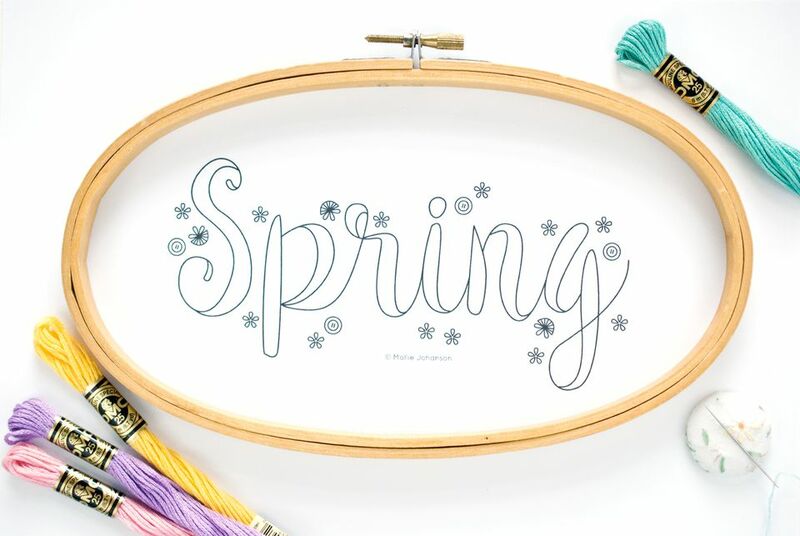 Of course, there are plenty of other ways to put some spring into your stitching. If you love the tiny flowers surrounding "Spring," you'll also love the May Flowers embroidery pattern, featuring an umbrella overflowing with stitched florals. In fact, they'd look wonderful as companion embroidery hoops! To get started, download the Spring embroidery pattern JPG. Print it out on water-soluble stabilizer for easy pattern marking, or on standard paper if you plan to use another transfer method. If you set the image to fit a standard size piece of paper in the print dialog box, the pattern should fit in a 5" x 8" oval embroidery hoop. Note: This pattern is copyrighted by Mollie Johanson and is for personal and cottage-industry use only. Choose a light-colored linen or evenweave fabric for this project. Quilting cotton will also work. Because of the size of the flowers, a relatively tight weave is a good choice. If you want to use a linen that has a looser weave, be sure to iron midweight interfacing to the back of the fabric before you begin. This will keep the stitching more accurate as you work. Once you have the pattern on your fabric, and the fabric securely in a hoop, you can start stitching. When selecting colors for this project, look for hues that remind you of spring. They could be pastels as shown, or something a little brighter. The design would even be pretty stitched entirely in white on a natural linen fabric. The suggested colors shown in the sample are DMC 993, 3716, 209 and 743. A variety of stitches will work for the different parts of this pattern, but these recommendations will get you started. For the lettering, use back stitch for the thin lines and satin stitch for the thick, filled in areas. Use the tiny flowers guide for stitching the florals around the word "Spring." The tiny roses use a form of stem stitch. The pansies are made with blanket stitch and detached chain stitches. The yellow flowers are lazy daisies, also made with detached chain stitch.